Should we limit over the counter medicine on prescription? The NHS in South Nottinghamshire has today launched an engagement exercise to get people’s views about whether over the counter medicines should be on prescription for minor ailments. People can comment on proposals to initially limit prescriptions for medicines for minor ailments from Monday 19 December 2016 to Friday 3 February 2017. Minor ailments are those which can be treated with self-care and over the counter medicines, which are medicines you can buy in a supermarket, shop or pharmacy. The NHS is facing financial challenges which means we have to review the services we deliver. The Big Health Debate asks patients what they think and ensures the patient voice is heard as we plan services for the future. As part of this, the South Nottinghamshire NHS, which covers Rushcliffe, Nottingham North and East and Nottingham West, need to prioritise how they spend their prescribing budgets. Nationally, seven million GP consultations every year are for minor ailments that could be self-treated at home. This takes, on average, one hour per day of GP’s time and costs the NHS £2 billion per year. Paracetamol can cost as little as 20p per packet in some supermarkets – paracetamol on prescription costs the NHS a minimum of FIVE times much as average supermarket costs. We are proposing to limit prescriptions for over the counter medicines for minor ailments. We’d like to know what impact this proposal might have for local patients, so we are running six weeks of engagement activity (Monday 19 December 2016 to Friday 3 February 2017) to seek your views. 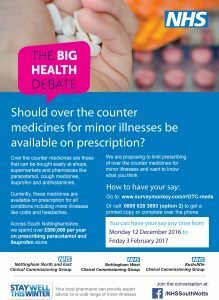 Please fill in this survey and tell us what you think about this proposal and also about whether other over the counter medicines should be on prescription for minor illnesses.